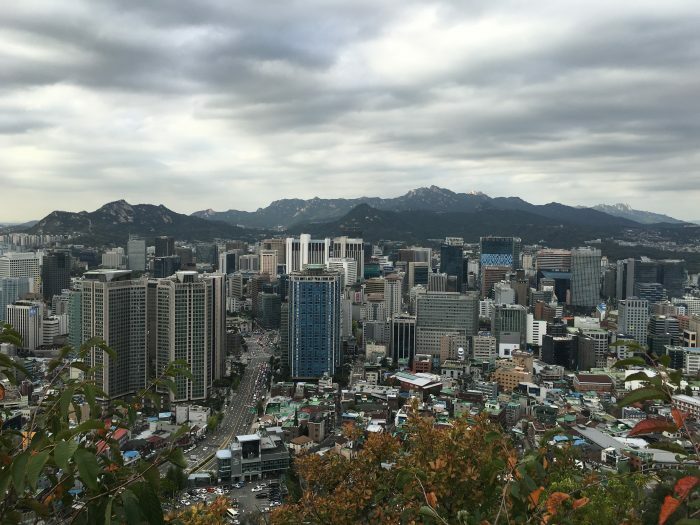 One doesn’t usually associate massive cities with hiking, but thanks to a ring of mountains surrounding the center of the city, Seoul, South Korea is one of the world’s best cities for urban hiking. 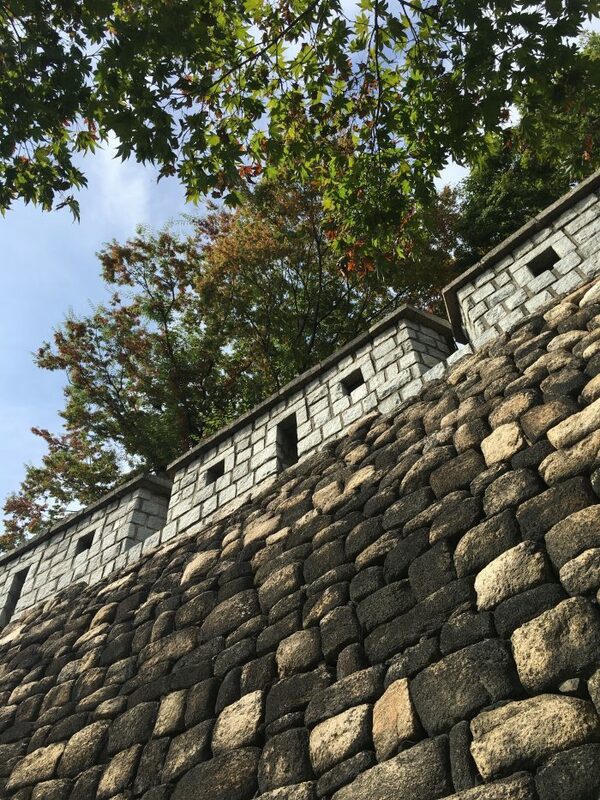 While there are many mountainous areas to hike around Seoul, the unique Seoul City Wall & its trails make for a fantastic way to explore the city’s history & unique geography. 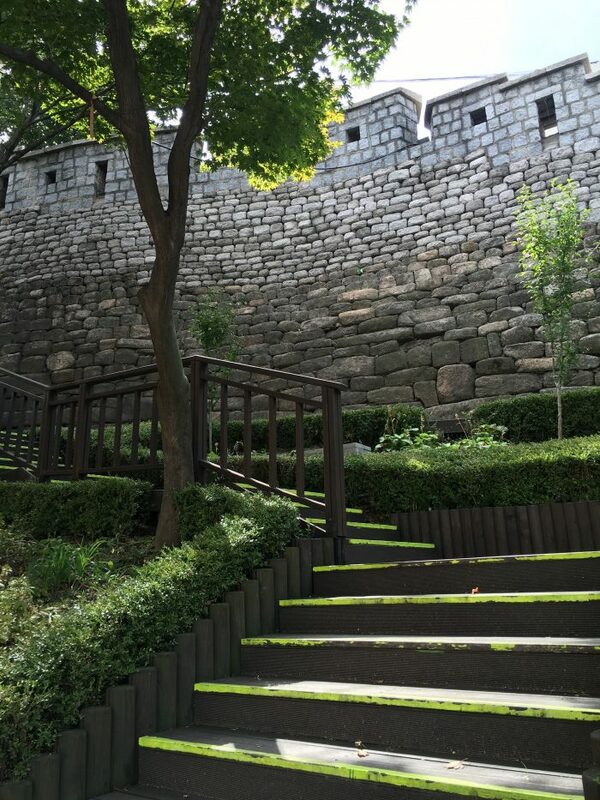 Once used for defense, the Seoul City Wall now forms the backbone of a hikeable path circling the city. There are six sections to this path, which makes for a great way to get between various tourist sites in Seoul. I hiked three of them while I was in Seoul. 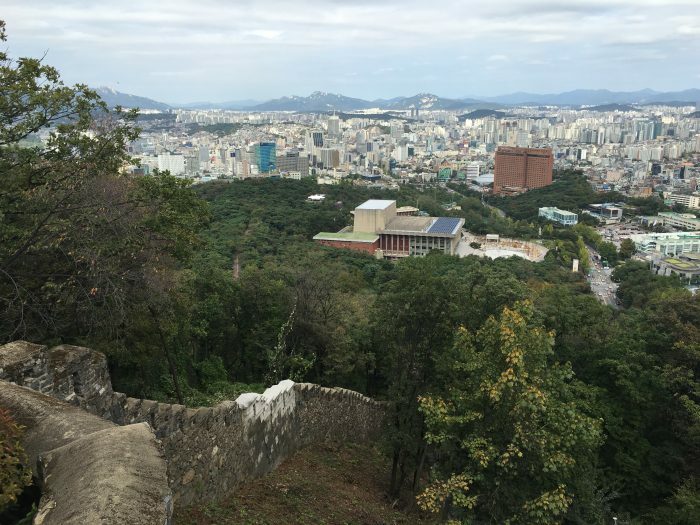 The first part of my hike around the Seoul City Wall was the Naksan Mountain Trail section. The second part was the Heunginjimun Gate Trail. On a different day, I did a third section, the Namsan (Mongmyeok) Mountain Trail. 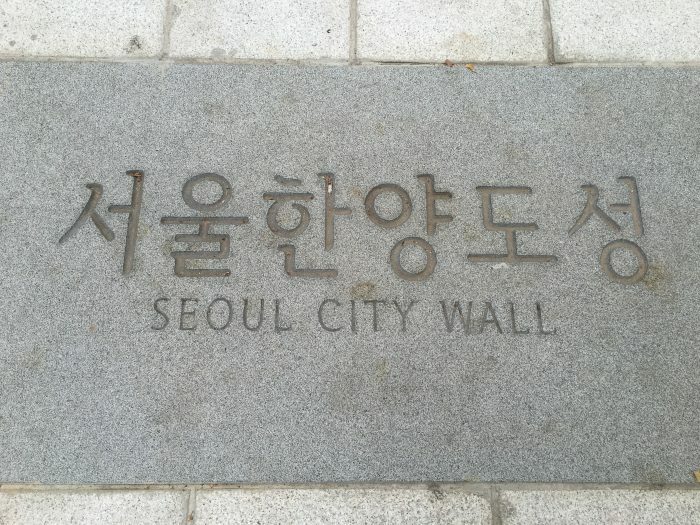 Here is a map of all of the parts of the Seoul City Wall hiking trail. 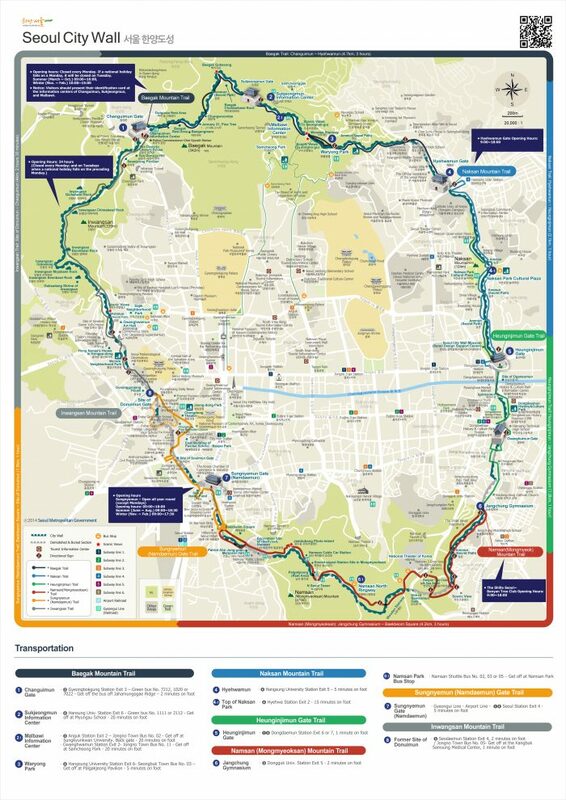 The route is well-marked, and there is also this nice map available from the official city website. The Namsan Mountain Trail begins at Jangchung Gymnasium, near Dongguk University subway station. Take exit 5 and head south. To your left, heading north, is the Heunginjimun Gate Trail. To the southwest is Mt. 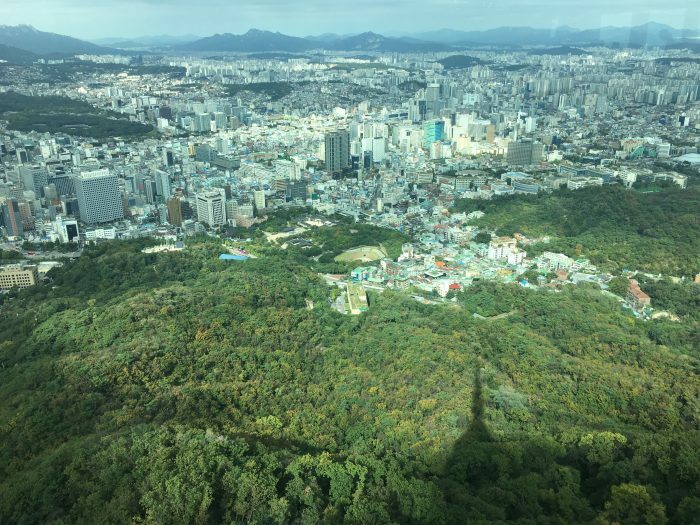 Namsan & its surrounding hills & parks. Unlike the Heunginjimun Gate Trail portion of the hike along the Seoul City Wall, the wall is visible for most of the Namsan Mountain Trail. Follow the street to your right, and you will see this set of neon steps at the beginning of the trail. 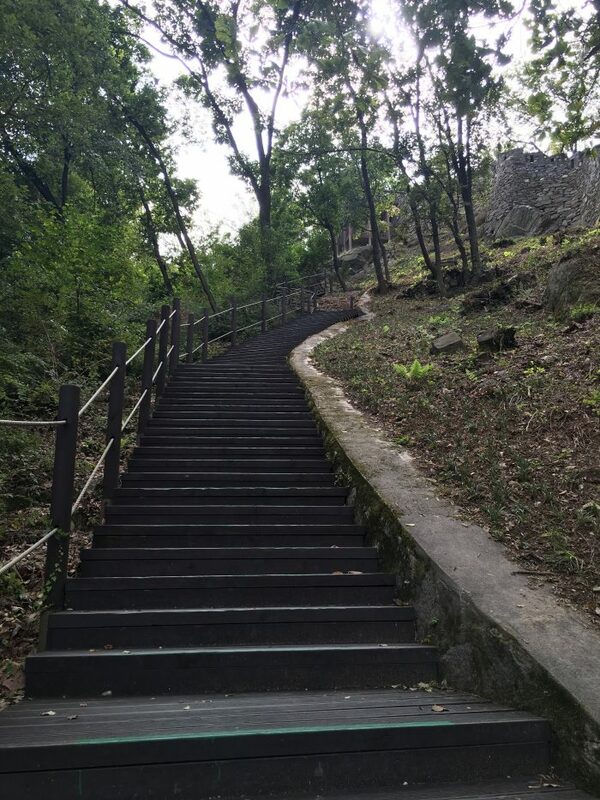 The first part of the Namsan Mountain Trail is along a nice path with a gradual climb. There are some stairs, but nothing straight up. At least not yet. We’ll get to that in a bit. 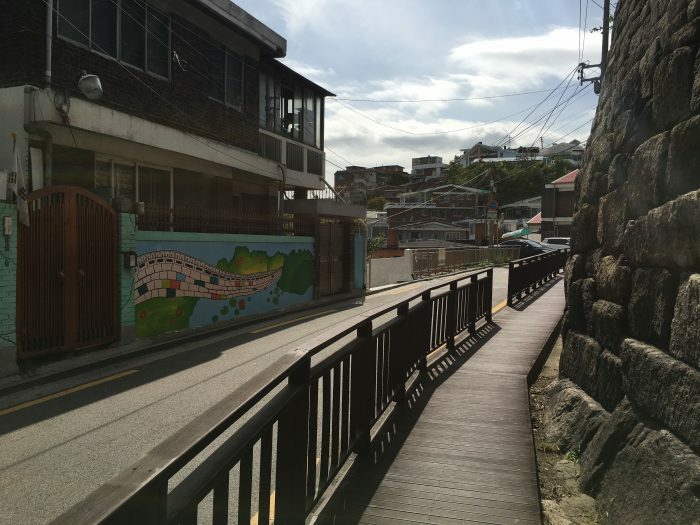 This section of the Namsan Mountain Trail passes through a neighborhood, provided you have stayed down here and not already walked along the wall in the park on the other side. The wall is continuous here, and it’s a quiet area. It was a much sunnier day than my previous hike. Thankfully, it was a bit less humid and much less polluted. You’ll eventually reach a point where you have some options. You can either continue straight through the neighborhood, following the signs toward the theater, or you can go under the wall, climb the stairs, then continue on top of the wall. I chose the latter so I could be inside the park. The path climbs a bit more, finally reaching a point with lots of options at the Dasan Palgakjeong Pavilion. There is a map showing where you go. 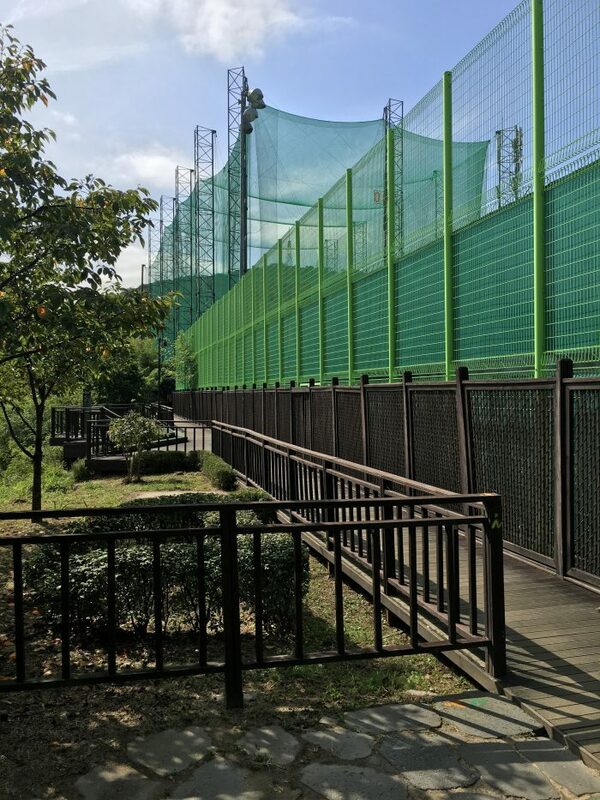 The main path of the Namsan Mountain Trail continues past the driving range and tennis courts, toward Namsan Park. This is the only part of this section of the trail where the wall no longer exists. The driving range is actually where the wall used to be. The views begin to open up toward Mt. Namsan. You will see the hills you will eventually be climbing, while also catching your first glimpse of Seoul Tower. From there, the marked trail winds around a resort & conference center, then downhill across a road toward the National Theater of Korea. Unfortunately, you’ve just climbed downhill only to have to go right back up. You are now in Namsan Park. You can either continue to follow the Namsan Mountain Trail & the City Wall along the brick path, or you can go explore the park. 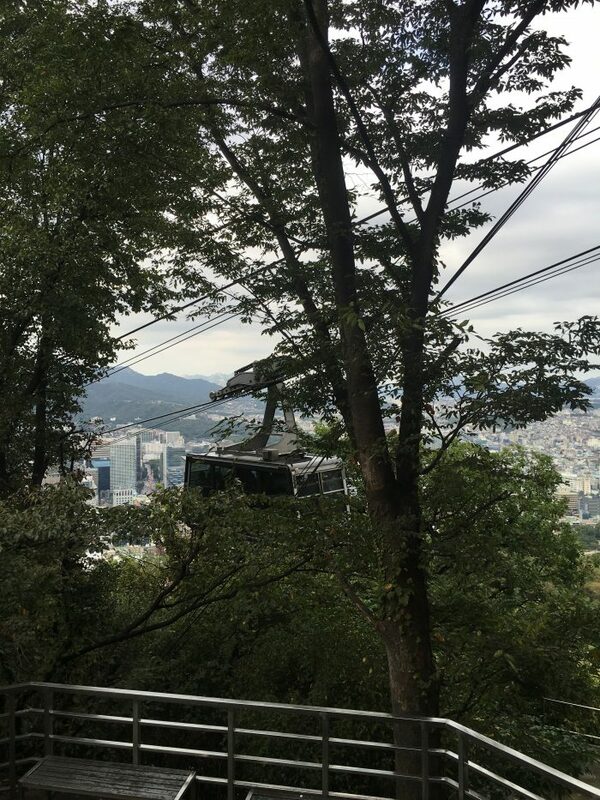 The trail climbs to the highest points of the park, and eventually up to Seoul Tower. If that’s too much climbing, you can stay lower in the park. 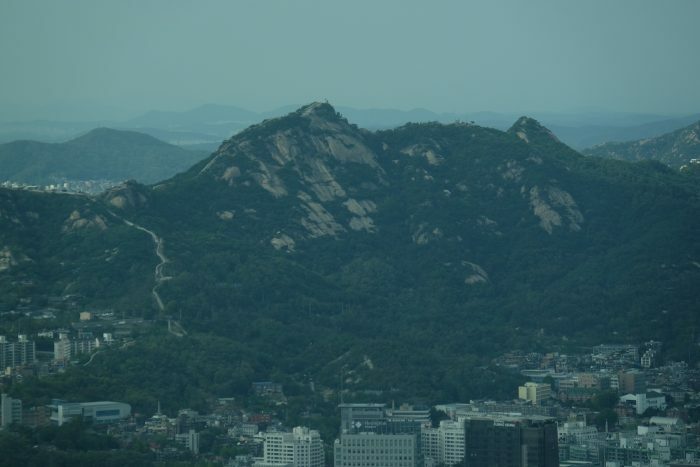 The Namsan Mountain Trail continues toward the Mongmyeoksan Beacon Towers, which are 1.5 km away. The trail meanders away from the wall for a while, but you eventually curve back to where you can see the walls again. If you follow the wall to the right, you’ll see a massive staircase. This is where I will say that this trail was more strenuous than the previous two I had hiked. 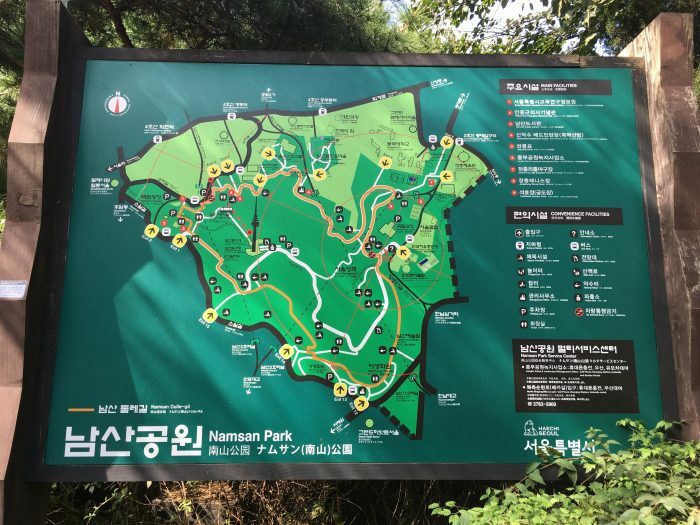 According to the map, it should take about three hours to complete the entire route of the Namsan Mountain Trail. However, this is dependent upon how many stops you make along the way, as well as how long it takes you to climb these stairs. The staircase is perhaps half a kilometer long, but there are no breaks aside from a few platforms. My legs were in agony by the time I reached the top. Thankfully there was a bit of a cooling breeze, but this would be a miserable climb in more heat or pollution. There weren’t many people out, so it was quiet aside from the buzzing of insects and chirping of birds. There is a viewing platform at the top of the staircase. Down below, I could see the gym I had at, and well beyond. Looking further, I could see the other parts of the Seoul City Wall trail that I had done the day before. From here, the path crosses the wall, then zig zags around the wooded hills. Seoul Tower continues to get closer. Before long, you’ll arrive at a road. It’s at this point that you realize that your tranquil walk is done. 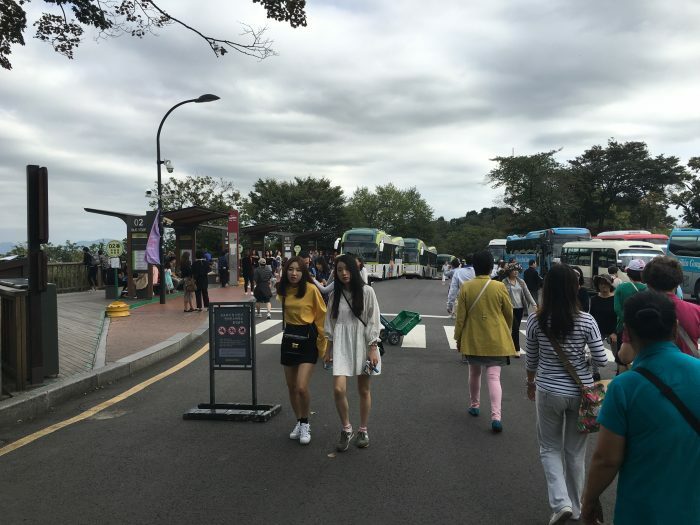 This is the road that tour buses take up to Seoul Tower. You’ve just done a strenuous hike that other people will just ride up. There were few people on the Namsan Mountain Trail, but the parking lot was mobbed. Not only was it mobbed, the people there weren’t making the experience any more pleasant. A group of smokers were smoking right in front of a non-smoking sign. A gardener went over to yell at them to stop, and they just stood there and grinned at him. 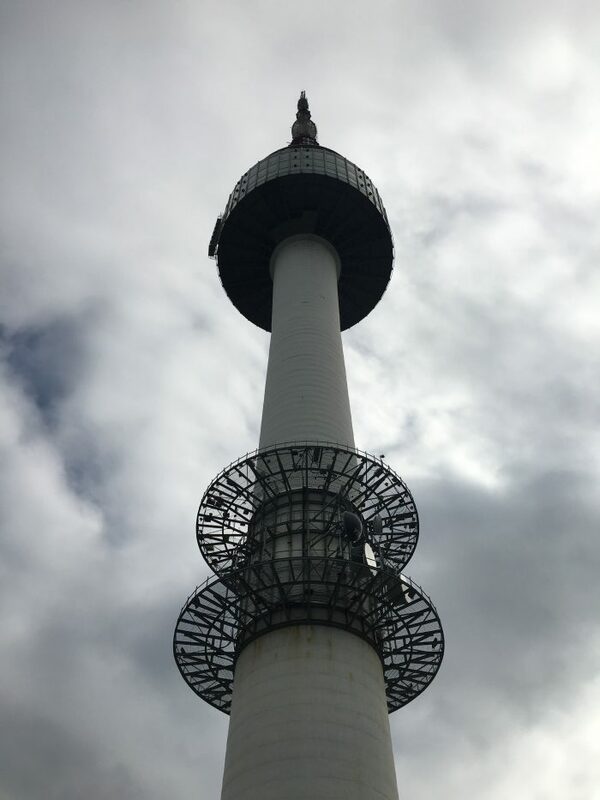 Seoul Tower is a 236.7 m (777 ft) observation tower that sits at the top of Mt. Namsan. The views of Seoul from the top are phenomenal. Had the weather been poor, I wouldn’t have gone up, but with visibility being decent and the price being reasonable, I figured “why not?”, since I had walked all the way up, plus it had only taken me an hour and a half to get there. A ticket to the top costs 10,000 won, which isn’t unreasonable for access to an observation deck such as this. That said, I’m not sure why a lot of my fellow visitors had paid the money, only to sit with their backs to the view, eating snacks or shopping. 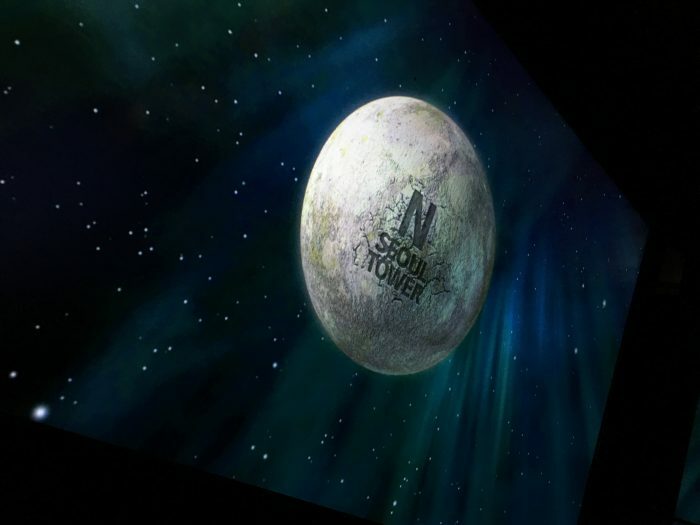 The elevator ride begins with a crazy video of you being shot into space, which may be a slight exaggeration. 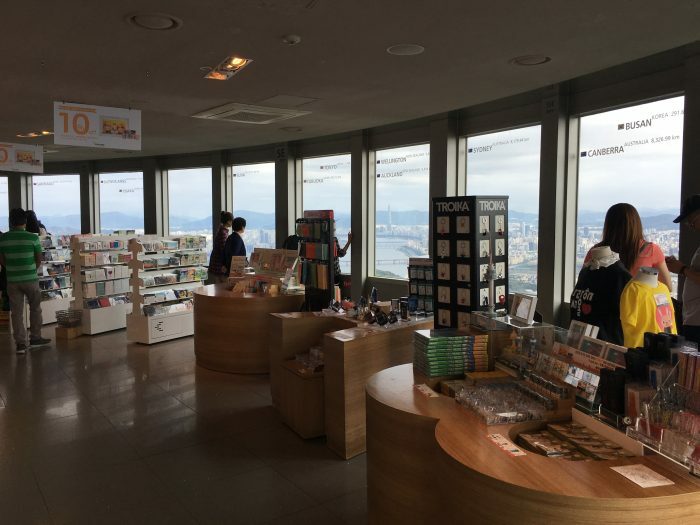 The top of Seoul Tower has spectacular 360-degree views all around Seoul. It’s a great way to get a full perspective of the city. Even though the clouds had started to come in, the air was reasonably clear, so I could see all of central Seoul down below. I could see all of the Five Grand Palaces of Seoul that I had visited. In the other direction, I could see the city walls I had hiked along. 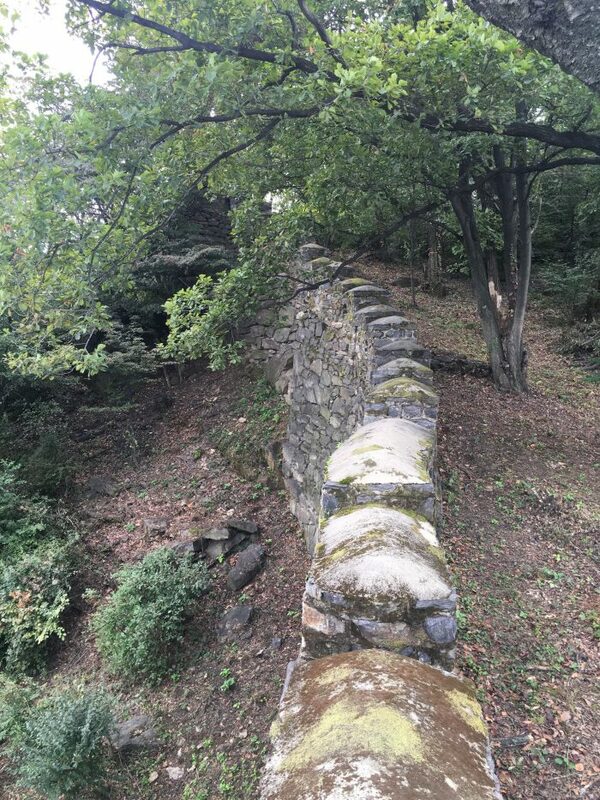 I could also see all the way to the mountainous northern sections of the Seoul City Wall trail. I stayed up at the top for about half an hour, then I took the elevator back to ground level. Down below, there is a multi-level complex with shopping, restaurants, and bars. There is also a nice plaza outside with plenty of seating. 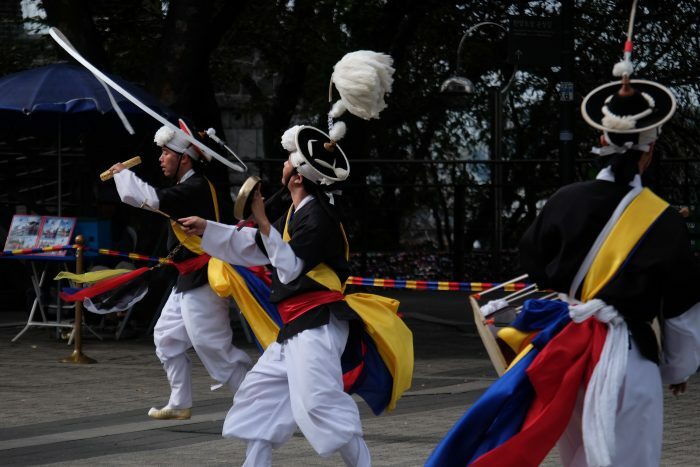 This plaza hosts live performances of traditional Korean music & dancing. 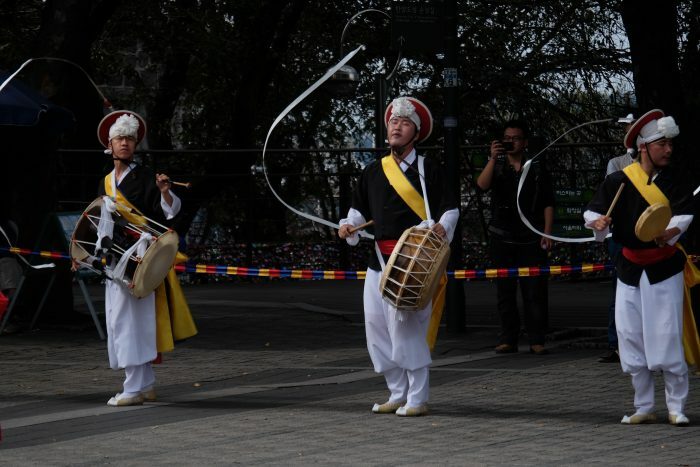 These guys who played drums & danced with ribbons were impressive. After watching the dancers for a while, I continued back along the Namsan Mountain Trail. This section is much busier, as many people take the cable car to the top, then walk back down to the city below. At Jambdubong photo island, I was treated to another great panoramic view. As you’re further back down the mountain, you can get a better sense of how tall and dense the buildings of central Seoul are. It was cool to be able to see all the areas I had visited from one spot looking over the city. 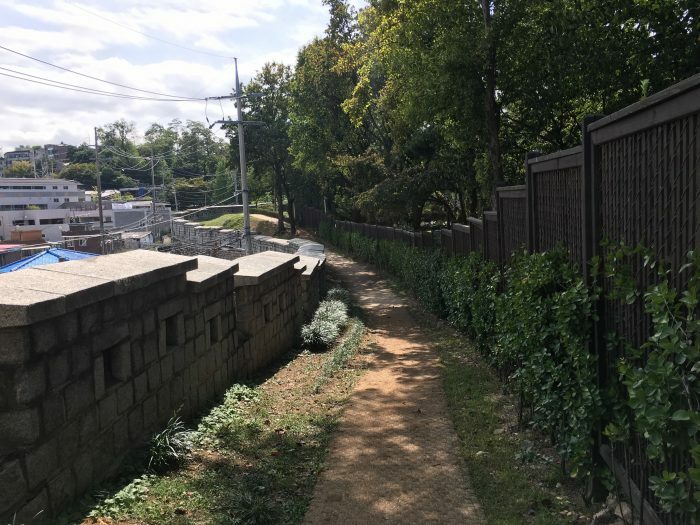 This last part of the city wall along the Namsan Mountain Trail was under construction when I visited. 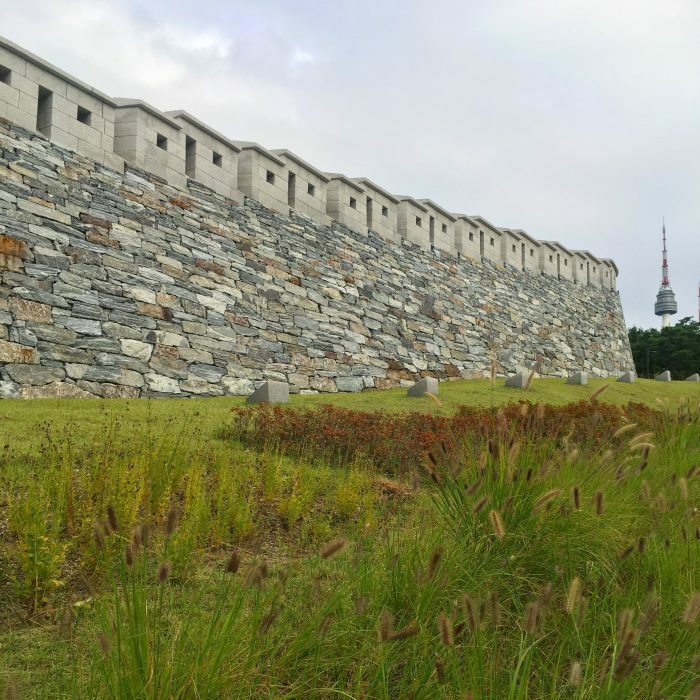 It’s good to see that Seoul is continuing to do work to preserve & restore the wall where it can. There are certain places where this won’t always be possible, such as this parking lot. However, they had still included an outline of the wall through the pavement, allowing people to continue along the path. 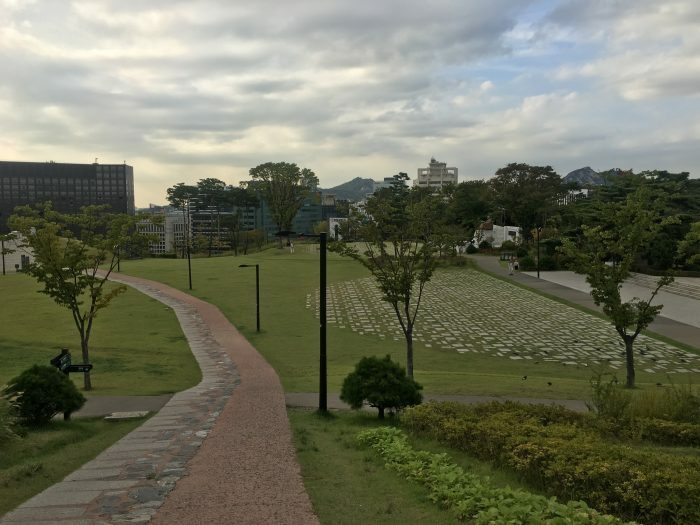 As you get closer to the city, there’s one last park to walk through. It’s a wide open space that looks like a very new construction. The wall itself looks brand new as well. 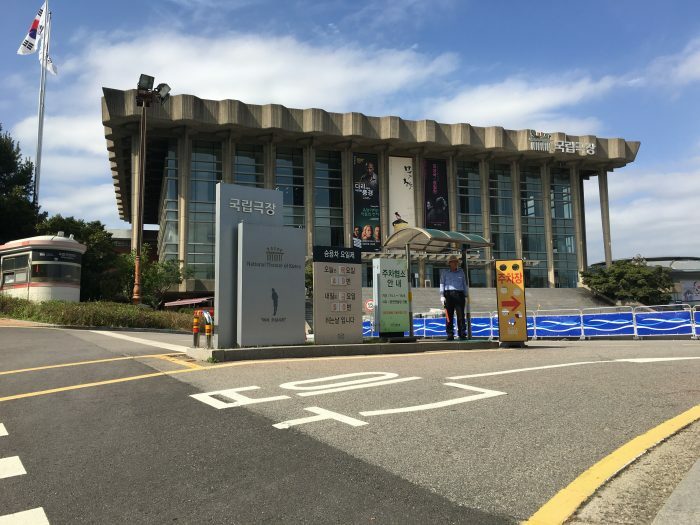 As nice as authentic history is, this is kind of cool in its own way, since it shows Seoul’s commitment to restoring what parts of history it can. 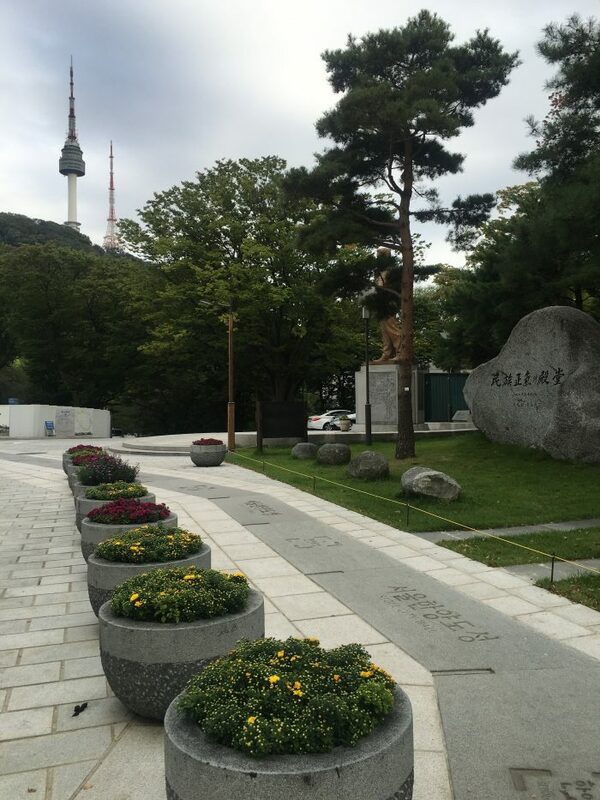 This park is the end of the Namsan Mountain Trail portion of the Seoul City Wall trail. From here, the trail heads north toward Sungnyemun Gate. Unfortunately, I didn’t have time to complete more sections of the trail, since I had to get to a KBO baseball game at Jamsil that evening. 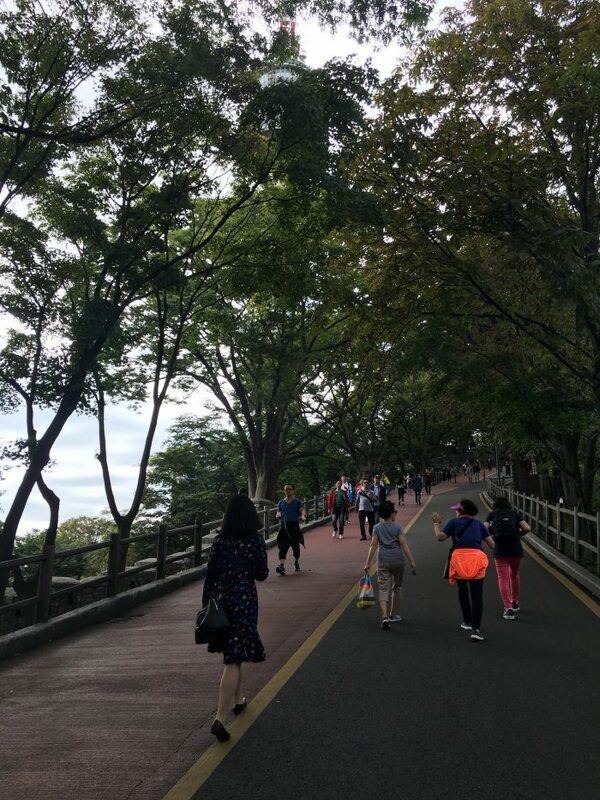 If you can only do one section of the Seoul City Wall trail, the Namsan Mountain Trail is a nice overview hike, combining moderate hill walks with parks & great views, especially from Seoul Tower.